Say hello to Spring with a fun weekend of golf at the impressive Hellidon Lakes. Two rounds of golf, a quiz and discount on retail, what better way to spend a weekend. Now all we need is the sun to shine! Come and join us for a sociable, friendly golf break at Hellidon Lakes, which has a growing reputation as one of the UK’s most popular golf destinations. The resort has the perfect combination of a beautiful golf course, considered one of the Midland’s finest, where the resort’s stunning lakes plus its spectacular scenery make Hellidon Lakes a gem in the Northamptonshire countryside. A perfect, tranquil setting to enjoy your golf and the company of your fellow Solos golfers. We will play 2 rounds of organised mixed team competition golf on Hellidon Lakes Golf Course and spend 2 nights in the charming hotel, where our group dinners each evening should provide a fun and sociable interlude to the golf. As you might have guessed by the hotel name, the golf course at Hellidon Lakes is renowned for its water features. It’s an interesting challenge for even the most competent golfer, so we can play the safe game or run the water hazard risk with no less than 16 lakes ready to swallow a wayward ball– be warned! The hotel is located off Junction 16 of the M1 with Long Buckby station just 8 miles away. Complimentary car parking is available. With its name derived from the eight lakes within the 220 acres of landscaped grounds, this gem of a hotel has a 27 hotel golf course (18 holes plus the additional valley 9 hole course), 2 bars, a restaurant and 4 lane bowling. Features in the Health Club include a gym, indoor swimming pool, steam room and Jacuzzi. The modern bedrooms contain a TV, telephone, trouser press and iron, tea/coffee making-facilities and hairdryer. 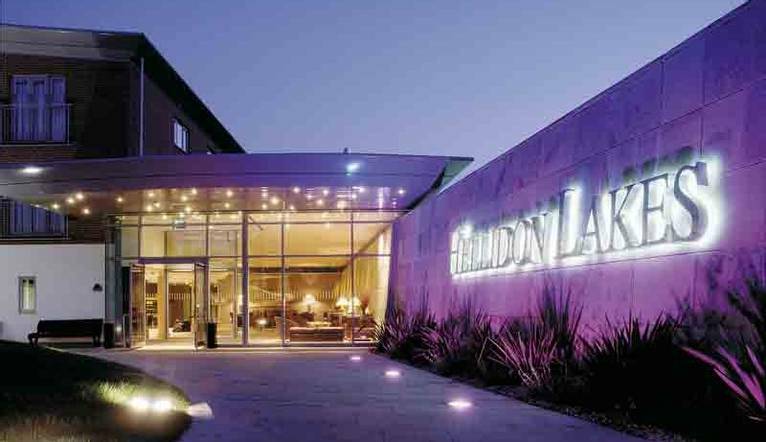 2 rounds of organised golf at Hellidon Lakes Golf & Spa Hotel. A golf handicap is necessary for this holiday.